In my previous blog I talked generally about my PhD and some of the developments that lead it to take its present form. In this blog I’d like to look at two or three (well, three, actually) areas that I’ve ended up being especially interested in as my research has progressed. In a tribute to their eighteenth-century focus and in an effort to make a spectacularly bad travel-related pun, I shall dub these my ‘hobby horses’: the topics that – if inadvertently introduced at a conference bar – may lead to an epic series of Shandean tangents and digressions. . .
Firstly, I’m very interested in the role played by Picturesque travel books in locating the Gothic ahead of its mass popularity as a fictional ‘genre’ at the end of the century. The Picturesque is something scholars have always tended to be aware of as a discourse within novels (often working in tandem with versions of the Sublime or Beautiful) but it’s easy to miss the way in which writings such as William Gilpin’s constitute their own sphere of print-culture, within which the Gothic is an important feature for almost a decade before authors like Ann Radcliffe and Charlotte Smith kick off the 1790s ‘explosion’ in Gothic fiction. The 1780s are a bit of a fallow period in the traditional canon of Gothic writing, following the publication of Clara Reeve’s The Old English Baron in 1777 and Sophia Lee’s The Recess in 1783. Counter-examples do exist, including Anne Fuller’s criminally overlooked Alan Fitz-Osborne in 1787 – a novel that just happens to include a female spectre holding a bloody dagger (no, really). On the whole though, we sense that the real ‘explosion’ of the Gothic into print-culture hasn’t happened yet. Except that during the 1770s a modest, schoolmaster has been travelling all over Britain, discussing the Gothic markers and materials – the ruins of castles and abbeys – within its landscapes. Then, upon retirement, he’s spent the 1780s publishing very successful travel books derived from these journeys; books that offer a vocabulary for addressing and discussing those Gothic materials for a growing readership that hasn’t even heard of Ann Radcliffe, Matthew Lewis or the Minerva Press. That man was William Gilpin and he was born in a ruined castle (no, really). Now, the Picturesque aesthetic and the travel and print cultures that develop in relation to it don’t really offer a sensational indulgence of the Gothic imagination. Gilpin himself isn’t particularly interested in seeking or invoking the supernatural and his aesthetic works to frame and screen Gothic sites in a manner that has plenty of obvious political connotations for an enlightened British readership. Nonetheless, it’s clearly significant that this other region of print culture – of (proto?) Romantic Textuality, if you will – is already doing some important work in bringing the Gothic into focus for readers in the late-eighteenth century. Accordingly, I’ve been particularly interested in looking at the way Gothic novels of the late 1780s and 1790s import strategies for framing Gothic sites from the Picturesque. 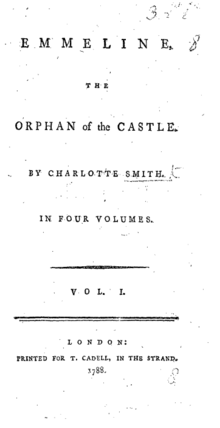 This brings me to my second hobby horse: the early work of Charlotte Smith. Like the Picturesque, Smith is an established feature of the Gothic landscape (there’s a pun in there somewhere) but her work hasn’t always been subjected to as much examination as her contemporaries. This is partly, I think, because of a hesitancy to take up Smith as a Gothic author, but it’s precisely this that interests me. Smith isn’t a Gothic novelist – certainly not in the same sense as Radcliffe or Lewis. Her early novels are fictions that include castles, abbeys and their ruins, but these are never the centre of the narrative in the manner of a castle Otranto or Udolpho. That, I think, is actually quite important. What those castles or abbeys represent instead are a set of Gothic (or potentially Gothic) materials in contemporary (often British) landscapes about and towards which Smith’s characters – her ‘heroes’ / ‘heroines’ and ‘villains’ – exercise different attitudes and adopt different perspectives. Which is to say that the status of the Gothic site in Smith’s early fiction is much the same as its status in the Picturesque tourism whose landscapes she draws upon and places her fictional Gothic structures within. In fact a Picturesque vocabulary is frequently referenced in Smith’s novels as a means of talking about these (and other) sites and differentiating characters’ social and political sensibilities thereby. 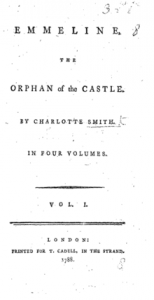 Smith publishes her first novel in 1788 just ahead of Ann Radcliffe’s debut in 1789. There is, I think, some evidence to suggest that Radcliffe may have been aware of Smith’s work before she started writing and their subsequent familiarity with each other is made clear by mutual quotation in the early 1790s. 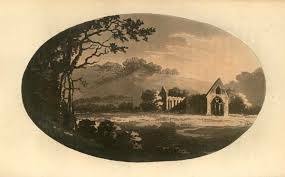 What this means for me is that Smith, with her incorporation of a Gothic framed within the Picturesque and her inter-textual relationship with Radcliffe, takes on a particular importance as one of the vectors through which these fictions engage with that existing arrangement of the Gothic in eighteenth-century print culture. My final area of particular interest – at least for the purposes of this blog – is more general. When Ellen Moers defined (or, at least, coined) the “Female Gothic” in 1978 she associated it with something she called “travelling heroinism” and spoke of a focus upon a movement of female protagonists through landscapes that provided imaginative stimulation and a kind of acculturation. For Moers, these landscapes were largely imaginary and unreal and this is a point at which I differ from her: arguing instead for a deeper engagement with the represented geographies of contemporary travel-culture and its writing. Of course Moers’s category has also been subject to debate, which has questioned its essentialism and scholarly utility. I think the correlation Moers draws between travel and a form of Gothic writing produced by women and / or centred on female experience is important though. Because women’s participation within traditions of travel such as the Grand Tour was highly mediated and often ambivalent, pioneers such as Hester Thrale Piozzi (whose 1789 Observations and Reflections is probably the first woman’s account of the Grand Tour written in continuous prose and published under her own name) offer a potentially revisionary perspective on established modes of travel and its writing. Part of my work involves examining these in conjunction with novels that may draw upon them and asking to what extent there might a useful category of “Female Gothic” centred on a version of women’s travel and shaped by accounts of women’s experiences as travellers. Having offered my own brief tour of those areas of interest I’ll sign off for this blog. With luck I’ll be back soon to tell you all why the frontispiece to an obscure travelogue you’ve (probably) never heard of is really awesome. Thanks Carl! – I’m sure you will be familiar with it, actually. It’s the anonymous Journey to the Highlands of Scotland by A Lady – often attributed to Mary Ann Hanway, but Betty Hagglund’s work on this text has convinced me that’s probably not accurate. I’m interested in the frontispiece, which seems to set up an interesting encounter between a (seemingly male?) traveler and a ‘Gothic’ landscape that startles or obstructs them. I think it’s interesting that a text which criticises an idea masculine travel (in the form of Johnson’s Scottish tour) should gesture towards the Gothic in that way. . . though I haven’t (yet) been able to work out who the frontispiece was produced by or how specifically it was commissioned for the text. Ah yes, I know the text, though I’ve mostly just skimmed it. I didn’t really register the frontispiece, though; I’ll take another look at that!